Here’s the background. At the end of World War II, a 60-minute, silent documentary was found in the German archives on Jewish life in the Warsaw ghetto in the months before the ghetto was liquidated and its inhabitants shipped off to the extermination camps of Treblinka. For 45 years, the footage, among the only known footage of life in the Warsaw ghetto, was treated as fact, as documentary fact, until a fourth reel was found indicating that many of the scenes were staged by the Nazis. 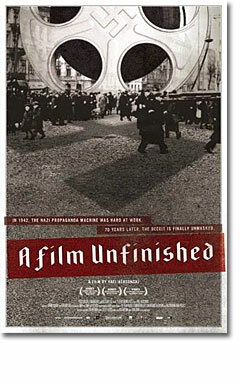 “A Film Unfinished” is Yael Hersonski’s 90-minute documentary on that 60-minute propaganda film. It’s no longer silent. She adds her own narration as well as readings from various diaries, including those of Adam Czerniaków, head of the Warsaw Judenrat (Jewish Council), and Heinz Auerswald, the Nazi commissioner of the ghetto. The victims, along with the perpetrators, have voices again. Two. She appreciates the power of the human face. She shows us not only the haunting faces in the silent propaganda film but the haunted faces of Warsaw ghetto survivors, “witnesses” she calls them in the credits, whom she films watching the silent propaganda film for the first time. There are five of them: four women and one man. The man has a slight smile on his face at odds with the heaviness of his sigh. The women simply looked pained. “Oh God,” one says, “what if I see someone I know?” Another: “I keep thinking I might see my mother walking.” There’s this tension between wanting to see and not wanting to see, between recovering this past and burying it forever. Will seeing her mother make things better? Or will it make the pain unbearable? Czerniaków’s diary details what was being filmed that day, the subterfuge that went into the filming, and then we see the footage. This bris, that ball, this show. The Jews in the show’s audience were held there all day, without food, without bathroom breaks, and ordered to laugh for the cameras. Initially one thinks the Nazis are doing the obvious: showcasing comfortable people to refute claims of horrible conditions. Except they also showcase the horrible conditions. We see piles of garbage. People were too weak to go downstairs, one witness says, so they simply threw garbage out the window. “I was 10 years old at the time,” another witness says, “and I was the dominant figure in my family.” She escaped the ghetto several times a week, risking her life, to get food for her family. We see emaciated people with shaved heads. We see children in rags. We see a corpse every 100 meters. The Nazis filmed it all. The point of the filming was, in fact, this juxtaposition. Here’s take 1, take 2, take 3 of a well-off woman buying meat at the butcher while children in rags starve outside. Here’s take 1, take 2, take 3 of sated couples leaving a restaurant and ignoring the emaciated woman in rags begging for a handout. Much of the footage was taken by Willy Wist, a German cameraman who testified during the war-crime tribunals in West Germany in the 1960s, and whose words, read by German actor Rüdiger Vogler, constitute less the banality of evil than the shrug of it. He didn’t know the ultimate purpose of the film; he just filmed it. He says, at one point, “I recall I had to film a mass grave,” and then we see that footage. A makeshift slide was created to deliver the corpses into the pit outside Warsaw. One lifeless, naked body after another slides down and lies crumpled at the bottom. It’s the final solution foreshadowed, and Wist filmed it all because it was his job to film it all. If this seems unforgivable it’s because it reminds us of us. We see a line, we thank the stars we’re on this side of it, and we continue to do what we do. It may be obvious, as you read this, why the Nazis staged what they staged—the ultimate purpose of their silent propaganda film—but it wasn’t to me watching Hersonski’s doc until about three-quarters of the way in. Was it explained outright? Was it implied? I forget. Hersonski’s narration tends to be quiet and even, and she presents most of the material without editorial comment. In this restraint she shows her artistry. “You’ve got to hold something back for pressure,” Robert Frost once wrote, and she does, and that pressure builds, and eventually, either nudged by her or by some spark in my brain, it hit me, the answer, and I felt a fresh horror wash over me. The juxtaposition between rich and poor Jews was justification. The Nazis were documenting a race of people so indifferent to the suffering of others that they didn’t deserve to live. They were documenting an excuse for extermination. In that moment of horror, of revelation, one understands the true meaning of propaganda. It is the powerful blaming the powerless for the crimes of the powerful. The Nazis herded 600,000 Jews into a single zone of Warsaw. They gave them no way to live. They let them starve. They let them die by the hundreds of thousands. Then they staged scenes of Jewish indifference to the suffering of others. I sat down for “A Film Unfinished” almost regretting sitting down. What else could I learn about the Holocaust that I didn’t already know? But there’s always fresh horror. The redemption, if there is any, is that the Nazis created a document of lies, and, from this, Yael Hersonski created a document of truth. She restores voices, and faces, and meaning.